Anti Zionist Orthodox Jews demonstrated in solidarity with the Palestinians on Al Quds Day. Excerpts from Rabbi Ahron Cohen message in support of the Palestinian people. 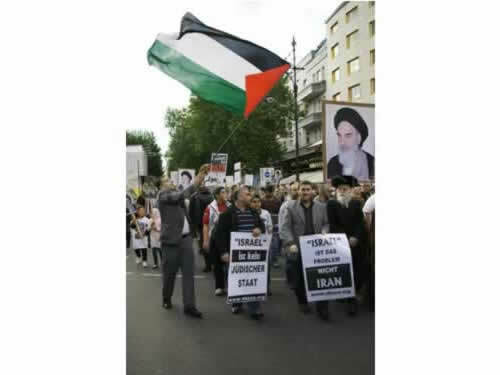 The pre-recorded full message was aired at the Al-Quds Day rallies in London and Berlin on 4 September 2010. Greetings to all of you gathered here today. I and my colleagues are Orthodox Jews, speaking under the banner of the group known as Neturei Karta, the group which tries to explain and publicise the Orthodox Jewish opposition to Zionism. Zionism, as I am sure you know, being the philosophy and movement which brought into being the so called “State of Israel”. I am speaking to you via a video made some days ago because today is our Sabbath and for religious reasons we may not make use of a microphone on the Sabbath. Al-Quds day is the day when we remember and feel the injustice of the unilateral Zionist control of the city of Jerusalem. The day which recalls and highlights the immorality and illegality of the whole Zionist State and enterprise. A State, which is based on a total disregard for the Palestinians” accepted claim for self determination in Palestine, and in particular their claim for Jerusalem. We are gathering in order to show support and help alleviate to some degree, the terrible and tragic suffering of the Palestinian people, which carries on and on as a festering sore. This Zionist enterprise has led to a continuous 100 year chain of confrontation, violence and suffering. In particular for the Palestinian People, but, I must say, also for many Jews faithful to the age old tenets of their religion and way of life. The philosophy and actions of the Zionists are perceived in the world as being a Jewish philosophy and Jewish actions. However, my message to you today is that not all Jews are Zionists. In fact the authentic Jewish teaching is that Zionism and Judaism are two totally differing and incompatible concepts. Authentic Orthodox Jews oppose Zionism totally, sympathise entirely with the Palestinian cause and protest vehemently the wrongs done to them. One of the purposes of this message is to help reduce the sordid stain which Zionism has imposed on the Jewish People. The vast majority of Jewish Religious authorities and lay people rejected Zionism from its inception. This is the genuine age old Jewish view. Sadly, this is now a minority view, never the less it is still a significant one and widely held. It is the only authentic Jewish view which has the authority of history. 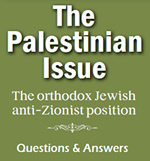 Orthodox Jewish opposition to Zionism is based firstly on religious belief grounds (appreciated more among the Jewish People themselves) preaching that Zionism is a rebellion against the will of the A-lmighty, that the Jewish People are in a divinely decreed state of exile which we are forbidden to try to bring to an end with our own efforts, and secondly on grounds of Jewish religious values of humanitarianism (grounds which are appreciated by anyone and everyone). When you observe what appear to be Orthodox Jews supporting Zionism, you should know that their philosophy and ideas are a tragic distortion of Judaism, totally foreign to the teachings handed down through the generations, long before Zionism existed. Zionism, with its aim of a State for the benefit of a specific group in someone else's land, is by definition a sectarian and racist philosophy. Having, as I mentioned earlier, from its foundation, a total disregard for Palestinian hopes of self determination in the land they had occupied for centuries. Leading on to a disregard for their livelihoods, homes and lives. Zionism by definition is a shocking contravention of humanitarian values, aiming to override by force, if necessary, any opposition. Zionism is wrong morally. It is also wrong logically. It was, from its inception, bound to produce confrontation, bloodshed, death and destruction for both Arab and Jew. This has in fact been the picture for 100 years up to the present day. Zionists in no way truly represent the Jewish People, as they claim. Furthermore, anti-Zionism is not anti-Semitism. If anything Zionists and Zionism are the cause of modern anti-Semitism. Charges and accusations as to which side in the conflict is currently to blame, are irrelevant. We in no way wish to condone violence, but to eradicate violence one has to seek out the root cause. The majority of international observers including the government of this country, omit to appreciate the basic cause of the problem, namely Zionism and its State. There is no doubt that the very existence of the illegitimate Zionist State of “Israel” is the underlying cause of strife in the Middle East and there will be no peace unless and until this cause disappears. This illegitimate State cannot last, falsehood must come to an end. It is wrong to say one cannot reverse what are called 'facts on the ground' How it will come to an end we do not know, but we pray for a speedy, total and peaceful dismantling of the concept of the Zionist State, to be replaced by a just regime in which Arab and Jew can live together peacefully as in previous times. May we then merit the time when the glory of the A-lmighty will be revealed over the whole universe and there will be peace among the whole of mankind.